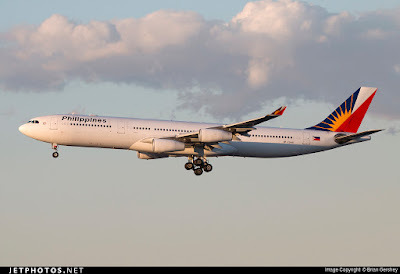 Aviation Updates Philippines - Philippine Airlines Flight PR117, an Airbus A340-300 registered as RP-C3441 made an emergency landing in Vancouver on December 31, 2016 due to an issue on flight controls. The same aircraft also made an emergency landing on December 26 due to a mechanical issue. According to a report at Aviation Herald, the A340 flight was climbing out of Vancouver when the crew ceased climbing at 7,000 feet. The pilots of the flight reported a flight control issue on the aircraft. The aircraft then held over Vancouver for 30 minutes and returned to the airport safely 50 minutes after departure. The Canadian Transportation Safety Board reported that ECAM messages indicate that "the flaps were locked and all brakes had exceeded temperature limits. The maintenance contractor performed an overweight landing inspection, reset the flaps and returned the aircraft to service." The aircraft remained grounded for 4 hours and 30 minutes but successfully reached Manila with a 5-hour delay. Five days earlier, the aircraft also encountered a problem with the plane's flaps. Philippine Airlines Flight PR117 on December 26 from Vancouver to Manila reported a problem and made an emergency landing in Vancouver 45 minutes after the time of departure. "The crew had flaps control problems after departure from Vancouver and held at 7,000 feet for about 45 minutes to burn off fuel," the Canadian Transportation and Safety Board reported. Fortunately, no one was reported to be injured. Source: News Talk 980 CKNW by Ria Renouf, Aviation Herald Article 1 by Simon Hradecky, Aviation Herald Article 2 by Simon Hradecky.